Poster of Stalin displayed at a public event in Leipzig in 1950. A celebration of Stalin's 70th birthday in the People's Republic of China. Joseph Stalin's cult of personality became a prominent part of Soviet culture in December 1929, after a lavish celebration for Stalin's 50th birthday. For the rest of Stalin's rule, the Soviet press presented Stalin as an all-powerful, all-knowing leader, with Stalin's name and image appearing everywhere. From 1936 the Soviet journalism started to refer to Joseph Stalin as the Father of Nations. Female members of the FDJ carry Stalin's pictures in the 3rd World Festival of Youth and Students in East Berlin. The Soviet press constantly praised Stalin, describing him as "Great", "Beloved", "Bold", "Wise", "Inspirer", and "Genius". It portrayed him as a caring yet strong father figure, with the Soviet populace as his "children". Interactions between Stalin and children became a key element of the personality cult. Stalin often engaged in publicized gift giving exchanges with Soviet children from a range of different ethnic backgrounds. Beginning in 1935, the phrase, "Thank You Dear Comrade Stalin for a Happy Childhood!" appeared above doorways at nurseries, orphanages, and schools; children also chanted this slogan at festivals. Speeches described Stalin as "Our Best Collective Farm Worker", "Our Shockworker, Our Best of Best", and "Our Darling, Our Guiding Star". The image of Stalin as a father was one way in which Soviet propagandists aimed to incorporate traditional religious symbols and language into the cult of personality; the title of "father" now first and foremost belonged to Stalin, as opposed to the Russian Orthodox priests. The cult of personality also adopted the Christian traditions of procession and devotion to icons through the use of Stalinist parades and effigies. By reapplying various aspects of religion to the cult of personality, the press hoped to shift devotion away from the church and towards Stalin. Initially, the press also aimed to demonstrate a direct link between Stalin and the common people; newspapers often published collective letters from farm or industrial workers praising the leader, as well as accounts and poems about meeting Stalin. Shortly after the revolution of October 1917 the Ivan Tovstukha drafted up a biographical section featuring Stalin for the Russian Granat Encyclopedia Dictionary. Even though most of the description of Stalin's career was very much embellished, it had gained so much favor with the public that they released a fourteen-page pamphlet of it alone named Joseph Vissarionovich Stalin: A Short Biography with a print run of 50,000. However, these sorts of accounts declined after World War II; Stalin drew back from public life, and the press instead began to focus on remote contact (i.e. accounts of receiving a telegram from Stalin or seeing the leader from afar). Another prominent part of Stalin's image in the mass media was his close association with Vladimir Lenin. The Soviet press maintained that Stalin had been Lenin's constant companion while the latter was alive, and that as such, Stalin closely followed Lenin's teachings and could continue the Bolshevik legacy after Lenin's death. Stalin fiercely defended the correctness of Lenin's views in public, and in doing so Stalin implied that, as a faithful follower of Leninism, his own leadership was similarly faultless. Lenin did not want Stalin to succeed him, stating that "Comrade Stalin is too rude" and suggesting that the party find someone "more patient, more loyal, more polite". Stalin did not completely succeed in suppressing Lenin's Testament suggesting that others remove Stalin from his position as leader of the Communist party. However some such as historian Stephen Kotkin have argued that these statements of Lenin were actually forgeries, they were not written or signed by Lenin but were allegedly spoken by him and taken down. According to V. Sakharov the dates on these allegedly forged portions also contradict the dates in the diaries of Lenin's secretaries and doctors. Kotkin argues that the leaders of the party, both Stalin and his opponents knew these segments were forged and for this reason they didn't have much impact and Stalin wasn't removed from his post even though he offered to step down. Stalin did not contest the validity of the forged segment but turned it into a propaganda weapon against his enemies. The allegedly forged section called him "too rude"; in answer Stalin admitted and apologized for his rudeness, but said he could not help being rude to those who harm the party. Lenin's sister Maria also defended Stalin against his opponents regarding his friendship with Lenin. Later even Lenin's wife N. Krupskaya came to Stalin's defense, despite earlier being a supporter of Zinoviev. After Lenin's death 500,000 copies of a photograph of the Lenin and Stalin apparently chatting as friends on a bench appeared throughout the Soviet Union. Before 1932, most Soviet propaganda posters showed Lenin and Stalin together. This propaganda was embraced by Stalin, who weaponized this relationship in speeches to the proletarian, stating Lenin was "the great teacher of the proletarians of all nations" and subsequently identifying himself with the proletarians by their kinship as mutual students of Lenin. However, eventually the two figures merged in the Soviet press; Stalin became the embodiment of Lenin. Initially, the press attributed any and all success within the Soviet Union to the wise leadership of both Lenin and Stalin, but eventually Stalin alone became the professed cause of Soviet well-being. Numerous pictures and statues of Stalin adorned public places. In 1955 a giant monument dedicated to Stalin was constructed in Prague and stood until 1962. The statue was a gift for Stalin's sixty-ninth birthday from Prague to commemorate "Mr. Stalin's personalty, mostly from his ideological features". After 5 years in the making, the massive 17,000-ton monument was finally revealed to the public which depicted Stalin, with one at the front of a group of proletarian workers. Statues of Stalin depicted him at a height and build approximating the very tall Tsar Alexander III, but photographic evidence suggests he was between 5 ft 5 in and 5 ft 6 in (165–168 cm). Stalin-themed art appeared privately, as well: starting in the early 1930s, many private homes included "Stalin rooms" dedicated to the leader and featuring his portrait. Although it was not an official uniform, party leaders throughout the Soviet Union emulated the dictator's usual outfit of dark green jacket, riding breeches, boots, and cap to prove their devotion. The advent of the cult also led to a renaming craze: numerous towns, villages and cities were renamed after the Soviet leader. The Stalin Prize and Stalin Peace Prize were also named in his honor, and he accepted several grandiloquent titles (e.g., "Father of Nations", "Builder of Socialism", "Architect of Communism", "Leader of Progressive Humanity" and others). The cult reached new levels during World War II, with Stalin's name included in the new Soviet national anthem. One way Stalin's cult was spread was through the Komsomol, the All-Union Leninist Communist League of Youth in Soviet Russia, created in 1918. The ages of these youths ranged from 9 to 28 years old making it a favorable instrument to reshape the members and ideology of the Soviet Union. This organization was created to raise the next generation into the type of socialist that Stalin envisioned. Being a part of this organization was beneficial to the participants for they were favored over a non-member when it came to getting scholarships and jobs. Just like most youth clubs, they focused on their member's education and health, with sports and physical activities. They also focused on their youth's behavior and character. The children were encourage to reject anyone who didn't embody the values of a socialist. In cases of lying and cheating on the schoolyard, it resulted to "classroom trials". Stalin wanted the best to prevail in his image of the future Soviet Union so he put into effect a decree that would punish juvenile delinquency to ensure the 'good apples' were the ones paving the road for his ideal society. Organizations like the Komsomol were not the only influences on the children at the time. Cartoons like The Strangers Voice by Ivan Ivanov-Vano, reenforced the idea of a Soviet culture by depicting foreign thinking and customs as unwanted and strange. Children would play their own version of 'Cowboys and Indians' as 'Reds and Whites' with children fighting to play the main party leaders like Stalin. The cult of personality primarily existed among the Soviet masses; there was no explicit manifestation of the cult among the members of the Politburo and other high-ranking Party officials. However, the fear of being marginalized made oppositionists sometimes hesitant to honestly express their viewpoints. This atmosphere of self-censorship created the illusion of undisputed government support for Stalin, and this perceived support further fueled the cult for the Soviet populace. The politburo and comintern secretariat (E.C.C.I.) also gave the impression of being unanimous in its decisions although this was often not the case. Many top ranking leaders in the politburo such as Zhdanov and Kaganovich sometimes disagreed with Stalin. Not all of Stalin's proposals were passed, but this was not made known to people outside the party leadership. The party leadership discussed and debated various alternatives but always presented themselves as monolithic to the outside world to appear stronger, more credible and unified. Among the leadership this was also considered correct Leninist practice, since the Leninist organizational principle of democratic centralism provided "freedom of debate" but required "unity of action" after a decision had been reached. The minority felt it their duty to submit to the will of the majority and Stalin himself practiced this when losing a vote. What Stalin thought of the cult surrounding him is unclear. Like Lenin, Stalin acted modestly and unassumingly in public. John Gunther in 1940 described the politeness and good manners to visitors of "the most powerful single human being in the world". In the 1930s Stalin made several speeches that diminished the importance of individual leaders and disparaged the cult forming around him, painting such a cult as un-Bolshevik; instead, he emphasized the importance of broader social forces. Stalin's public actions seemed to support his professed disdain of the cult: Stalin often edited reports of Kremlin receptions, cutting applause and praise aimed at him and adding applause for other Soviet leaders. Walter Duranty stated that Stalin edited a phrase in a draft of an interview by him of the dictator from "inheritor of the mantle of Lenin" to "faithful servant of Lenin". Additionally, in 1936, Stalin banned renaming places after him. Gunther noted, however, that Stalin "permitted and encouraged his own virtual deification ... Worship of him is Byzantine". The dictator could easily stop the adoration, but did not do so because "he knows the Russians understand a master. Or perhaps he likes them". A poster from 1934 came out featuring "banner of Marx-Engles-Lenin-Stalin" and at the time Stalin had omitted his name from that poster. Yet by 1938 Stalin was more than comfortable with the banner featuring his name. In some memoirs even Molotov claimed that Stalin had resisted this "cult of personality" but then soon came to be comfortable with it. To some degree, Stalin accepted the Soviet people's dedication to him as an embodiment of the Party, but he discouraged all interest in his private and family life, and divulged only limited personal information. He rarely appeared in public or met with ambassadors, as of 1940 had met only seven foreign journalists for formal interviews in 20 years, and during the first five-year plan made no speeches or public appearances for 18 months. The Finnish communist Arvo Tuominen reported a sarcastic toast proposed by Stalin at a New Year Party in 1935 in which he said, "Comrades! I want to propose a toast to our patriarch, life and sun, liberator of nations, architect of socialism [he rattled off all the appellations applied to him in those days] – Josef Vissarionovich Stalin, and I hope this is the first and last speech made to that genius this evening." I am absolutely against the publication of "Stories of the childhood of Stalin". The book abounds with a mass of inexactitudes of fact, of alterations, of exaggerations and of unmerited praise. Some amateur writers, scribblers, (perhaps honest scribblers) and some adulators have led the author astray. It is a shame for the author, but a fact remains a fact. But this is not the important thing. The important thing resides in the fact that the book has a tendency to engrave on the minds of Soviet children (and people in general) the personality cult of leaders, of infallible heroes. This is dangerous and detrimental. The theory of "heroes" and the "crowd" is not a Bolshevik, but a SR theory. The heroes make the people, transform them from a crowd into people, thus say the SRs. The people make the heroes, thus reply the Bolsheviks to the SRs. The book carries water to the windmill of the SRs. No matter which book it is that brings the water to the windmill of the SRs, this book is going to drown in our common, Bolshevik cause. I suggest we burn this book. A more accurate depiction of his childhood and achievements are found in many other areas of writing and genre. De-Stalinization was the process of political reform that took place after Stalin's death, where a majority of Joseph Stalin's actions during his reign were condemned and reformed. February 1956 was the beginning of the destruction of his image, leadership, and socialist legality under the thumb of Nikita Krushchev at the 20th Party Congress. The end of Stalin's leadership was met with positive and negative changes. Changes and consequences revolved around politics, the arts and literature, the economic realm, to the social structure. His death and the destabilization of his iconic leadership was met with the chance of new reforms and changes to his regime that had originally been immediately locked down under his ominous control. The tight lock he kept on what was published, what was propagated, and what changes to the government and economics, became accessible. With the control that Stalin held being passed on to the government, an endorsed methodology was ideally enacted. There after, a collective leadership system was the result. The result left Nikita Khrushchev, Lavrentiy Beria, Nikolai Bulganin, Georgy Malenkov, Vyacheslav Molotov, and Lazar Kaganovich as members of that committee. The state of de-Stalinization was soon after put into action by Krushchev as he took on an opposite personality into the government. This allowed for better relations with the West in the future. After Stalin's death, Nikita Khrushchev's 1956 "Secret Speech" to the Twentieth Party Congress famously denounced Stalin's cult of personality, saying, "It is impermissible and foreign to the spirit of Marxism-Leninism to elevate one person, to transform him into a superman possessing supernatural characteristics akin to those of a god." The "Secret Speech" initiated a political reform known as "the overcoming/exposure of the cult of personality", later called de-Stalinization, that sought to eradicate Stalin's influence on the Soviet society. This also led the people to find the liberation to revolt publicly in Poland and Hungary. These changes inevitably met with opposition. Even after losing favor with Stalin during his leadership, he still argued in favor of his regime and opposed de-Stalinization and criticized the new ruling committee.Mao Zedong along with some other communist leaders, while initially supporting the struggle against the "cult of the individual" criticized Khrushchev as an opportunist who merely sought to attack Stalin's leadership and policies in order to implement new different policies, that in the Stalin-era would have been considered anti-Marxist Revisionism. De-Stalinization was still taking place fifty years later. Noticeably however, this didn't mean it was the end in the traditional role and practice that the leadership came with, a monopolized rule. After Krushchev's attempt at condemning Stalin's cult-like legacy, another wave and form of de-Stalinization took place. This time there was neither condemnation or exoneration of his legacy. The second campaign aimed to restructure the Soviet Union entirely, engaging public constituencies to diminish communism and bringing an end to the U.S.S.R. It condemned not only Stalin and his cult but also the other followers in power and in the end attempted to adopt a Western democratic institute in place of the traditional and futal[clarification needed] totalitarian system. Nevertheless, the attempt didn't take hold as planned under Putin and the centralized monogamous rule returned.This failed attempt saw the return of the cult through solely the focus on the height of Stalin's leadership, the defeat of Germany's Nazis. During this period, Russia had lost its role as a global super power. Bringing the famed legacy of Stalin back into the country laid a foundation for the rebirth of the symbolic role Stalin held at the height of his legacy. The Third Wave, as it was called, aimed to program a reassessment of Stalinism and commemorate the victims of his totalitarian regime, drawing focus, primarily, away from the political and social connections as a whole. In classrooms across the country, students were now being taught out of a modern textbook written by Alexander Filippov, which embodies Stalin as simply an efficient leader who had the unfortunate responsibility to resort to extreme measures to ensure and return Russia to its leadership role on the global scale. A sense of rehabilitation for Stalin's legacy has taken place and new governing practices which allow more freedom in beliefs, both cultural and political had taken root. Through this new practice, there is a freer nature that the citizens are both allowed to profess a condemning attitude towards Stalin's leadership as well as professing a stance that is pro-Stalin. Notably, about a third of the population in Russia still view Stalin as the admirable leader, while the rest condemn his ruthless crimes. ^ Graeme Gill, "The Soviet Leader Cult: Reflections on the Structure of Leadership in the Soviet Union", British Journal of Political Science 10 (1980): 167. ^ Father of Nations at the Encyclopedic dictionary of catchy words and phrases. ^ a b c d e f g h i Gunther, John (1940). Inside Europe. Harper & Brothers. pp. 516–517, 530–532, 534–535. ^ Gill, "The Soviet Leader Cult", 171. ^ Catriona Kelly, "Riding the Magic Carpet: Children and the Leader Cult in the Stalin Era", The Slavic and East European Journal 49 (2005): 206–207. ^ Victoria E. Bonnell, The Iconography of Power: Soviet Political Posters Under Lenin and Stalin (Berkeley: University of California Press, 1999), 165. ^ Benno Ennker, "The Stalin Cult, Bolshevik Rule and Kremlin Interactions in the 1930s", in The Leader Cult in Communist Dictatorship: Stalin and the Eastern Bloc, ed. Balázs Apor et al. (New York: Palgrave Macmillan, 2004), 85. ^ Brandenberger, David (2014-05-14). Propaganda State in Crisis: Soviet Ideology, Indoctrination, and Terror Under Stalin, 1927-1941. Yale University Press. ISBN 0300159633. ^ Davies, Sarah (2005). Stalin: A New History. Cambridge, UK: Cambridge University Press. 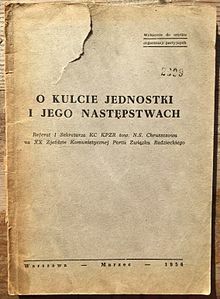 p. 252. ^ Kelly, "Riding the Magic Carpet", 208. ^ Gill, "The Soviet Leader Cult", 168. ^ Robert Tucker, Stalin in Power: the Revolution From Above, 1929–1941 (New York: Norton, 1990), 154. ^ Siegelbaum, Lewis. "Lenin's Succession". Seventeen Moments in Soviet History. ^ "The Forgery of the 'Lenin Testament'". ^ "Uncommon Knowledge: Part 1: Stephen Kotkin on Stalin's Rise to Power". ^ "The Trotskyist Opposition Before and Now". ^ "On the Relations between Lenin and Stalin". ^ Bonnell, The Iconography of Power, 158. ^ "Marxists Internet Archive - Reply to the Greetings of the Workers of the Chief Railway Workshops in Tiflis". www.marxists.org. Retrieved 2019-02-03. ^ Gill, "The Soviet Leader Cult", 169. ^ Avidenko, A. O. Halsall, Paul (ed.). "Hymn to Stalin". Internet Modern History Sourcebook. Fordham University, 1997. Retrieved September 2, 2012. ^ "Monster: The Monument That Destroyed Its Creator". RadioFreeEurope/RadioLiberty. Retrieved 2018-04-08. ^ "Komsomol | Soviet youth organization". Encyclopedia Britannica. Retrieved 2018-04-22. ^ a b "Stalin's Cult of Personality: Its Origins and Progression". The York Historian. 2015-09-18. Retrieved 2018-04-22. ^ "Life Under Stalin: Childhood or Cult?". 20th Century Russia. 2014-10-13. Retrieved 2018-04-22. ^ Arvo Tuominen. Sirpin ja Vasaran Tie. ^ Sarah Davies, "Stalin and the Making of the Leader Cult in the 1930s", in The Leader Cult in Communist Dictatorship: Stalin and the Eastern Bloc, ed. Balázs Apor et al. (New York: Palgrave Macmillan, 2004), 30–31. ^ a b Davies, "Making of the Leader Cult", 41. ^ "- The Personality Cult of Stalin in Soviet Posters, 1929–1953 - ANU". press-files.anu.edu.au. Retrieved 2018-04-08. ^ Davies, Sarah (2014). Stalin's World : Dictating the Soviet Order. New Haven: Yale University Press. ISBN 9780300182811. OCLC 875644434. ^ Arvo Tuominen, The Bells of the Kremlin, ed. Piltti Heiskanen, trans. Lily Leino (Hanover: University Press of New England, 1983), 162. ^ "Letter on Publications for Children Directed to the Central Committee of the All Union Communist Youth". Marxists.org. Retrieved 2018-04-27. ^ "Joseph Stalin - Facts & Summary - HISTORY.com". HISTORY.com. Retrieved 2018-04-24. ^ "ASURITE Sign-In". hdl.handle.net.ezproxy1.lib.asu.edu. Retrieved 2018-04-24. ^ "De-Stalinization | Soviet history". Encyclopedia Britannica. Retrieved 2018-04-27. ^ a b Khrushcheva, Nina L. (2006-02-19). "The day Khrushchev buried Stalin". Los Angeles Times. ISSN 0458-3035. Retrieved 2018-04-27. ^ a b Jones, Polly (2006-04-07). The Dilemmas of De-Stalinization: Negotiating Cultural and Social Change in the Khrushchev Era. Routledge. ISBN 1134283466. ^ "- The Personality Cult of Stalin in Soviet Posters, 1929–1953 - ANU". press-files.anu.edu.au. Retrieved 2018-04-27. ^ a b "Soviet Union and de-Stalinization Paper — Ascendnaamba.org". Ascendnaamba.org. 2018-01-05. Retrieved 2018-04-27. ^ a b "Nikita Khrushchev - Cold War - HISTORY.com". HISTORY.com. Retrieved 2018-04-27. ^ Lilya Kaganovsky, How the Soviet Man Was Unmade (University of Pittsburgh Press, 2008), 146. ^ Polly Jones (7 April 2006). The Dilemmas of De-Stalinization: Negotiating Cultural and Social Change in the Khrushchev Era. Routledge. p. 2. ISBN 978-1-134-28347-7. ^ "Truman confronts Molotov at White House, April 23, 1945". POLITICO. Retrieved 2018-04-27. ^ "Mao Tse Tung, On Khrushchov's Phoney Communism and Its Historical Lessons for the World". ^ a b c d e f g h "The Third Wave of Russian De-Stalinization". Foreign Policy. Retrieved 2018-04-27. ^ a b "Russia rewriting Josef Stalin's legacy". tribunedigital-chicagotribune. Retrieved 2018-04-27.